I spent this past weekend partly injured and partly working on some of the projects I have lined up. One of them was getting my Astorath project complete. He's the last model before I can ship the whole batch out to my friend. He's been waiting patiently, so I'm trying to get him done as quick as possible. The trouble is, the word quick doesn't go in the same sentence as wet blend, zenith highlighting and things like that. And I'm painting this guy to a higher standard than normal. I wanted to share how I did the blue armour on this guy. The highlights are done as though the light source were directly overhead shining down onto the model. If I couldn't see it from above, I didn't highlight it really. By doing this, it creates the feeling of light on the model and gives you a huge range of shades of your armour color on the model. In some places you have strong highlights and in others you have strong shadows. The combination of the two really make the model pop I think. 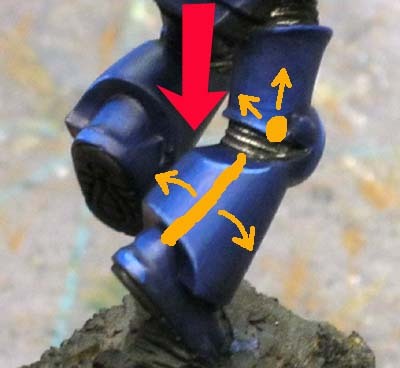 As I imagine the light coming down from above (the red arrow), I make a note of where it hits the surface of the armour plates. Each one acts differently to the light. Once I know where those spots are on the model (the orange line and dot), I mark them with my highlight color. A quick pass with the pure highlight color shows me the center of my highlight. From there, I work outward onto the armour plate and blend the edge of the highlight with the base color (the orange arrows). The blending is the longest part. It takes a while, but is worth it in the end. Once I have all my blending done, I go over the model with a thinned out wash again to sort of act as another blending tool to pick up those spots that could just use a little bit more to make them super smooth. And just for added contrast, once the wash is dry, I go back and touch up the center of my highlights just to make them pop a bit. It's amazing how quickly a wash can mute your colors. Once I have my highlighting done, I go in for that last little bit. Here's where we get into a bit uncharted water for me as I'm working on this technique to see what I can do with it. I started with my Deathwing model the other week and I'm trying it again here. On the few edges that my blended highlight falls, I go back with a lighter color and add a sharp edge highlight. This is done only in the places where the blended highlight meets an edge, it it NOT done over the whole model. The little green tick marks show the starting point for those edge highlights. From there it works it's way out and fades away (the green arrows) as the blended highlight underneath does as well. And here's the final part. I take black and go in the the shaded areas only and line the deepest portions with black. I don't do this all over the model, just in the shaded areas. 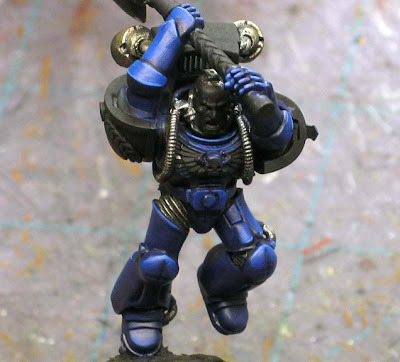 This has the effect of pushing the shadows even deeper and really giving you the range from black up to a bright edge highlight on the armour plates. Now I didn't snap a pic of this step, but I'll tell you it does add that extra bit to the model in the end. All in all, the only really hard part is the wet blending. The line highlighting for the bright edges is only done in a few places so it's not like you have to line highlight the entire model. The black lining is also done in a few places too. And it's more forgiving than it's bright counterpart since you're working in shadow anyway. As ever Ron you astonish me with how simple you make it sound but how complex it looks. If only I had more time and skill to paint like this and do the models justice. FromtheFang: Thanks. The hardest part is the blending. I suppose you could get away with drybrushing in place of it if you were careful enough. The line highlighting and blacklining just help to reinforce the effect. And even then, you don't have to cover the whole model. Excellent use of the technique Ron, i'll be having a go with that when i get round to my own Librarian. Tristan: I was surprised myself a bit when I realized how little "line work" I did with such a big impact on the look of the model. Really nice work there Ron, I will be trying this technique soon. Tiberius: Thanks, you should be pleasantly surprised at how nice the effect is once you give it a try. The blue looks stunning. If I ever collect a Chapter that sanctions Librarians will have to give your recipe a try. How is your injury going? Messanger of Death: The injury is much better, it was to my left arm so it did not affect my painting too much (I hold the model with that hand and paint with my right). That's good to know... be horrible to think that you couldn't paint because of an injury. Messanger of Death: Very true, It would be tough not being able to paint for any length of time. I suspect I'd try to fill my time with other things to keep my mind off it.